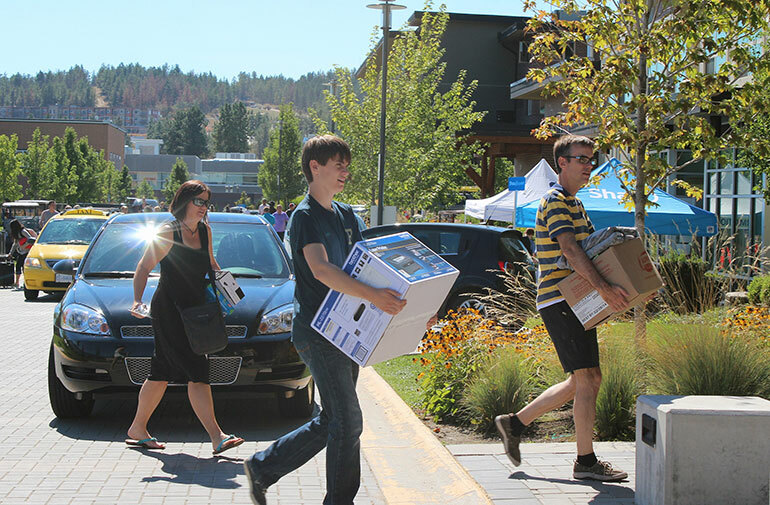 More than 1,000 students are moving into campus residences Sunday, September 3 starting at 8 a.m.
September is a remarkably busy time at UBC’s Okanagan campus; hundreds of new-to-UBC Okanagan students move into residence buildings during the Labour Day weekend. And this year, more than 9,000 students will be hitting the books when classes begin on the following week. It’s a finely-tuned, well-choreographed undertaking. In the matter of a few hours, UBC staff and student volunteers manage to move more than 1,000 new students into their university accommodations. Carloads of students arrive in waves, and as space becomes available outside the residences, groups are moved to their respective buildings, vehicles unloaded by volunteers, and boxes and belongings are moved into the corresponding rooms. After the initial welcome, residence students are encouraged to meet their new neighbours at community meetings. Parents of students living both on- and off-campus are encouraged to attend Parent Conference that starts at 1:30 in the gymnasium. This conference, tailored to meet the needs of new-to-UBC Okanagan parents, will offer specific details including financial information, student well-being, and academic expectations. When: Tuesday, September 5 starting at 8 a.m. The traditional first day of school at UBC Okanagan does not include classrooms or textbooks. Classes are actually cancelled while new-to-UBC students—fresh out of high school, those transferring from another university, and mature students—are encouraged to participate in Create. The day is filled with orientation activities that will set the tone for the academic year. A welcome ceremony takes place in the gymnasium starting at 9 a.m. when President Santa Ono will address the students. Later that morning, students are encouraged to participate in campus tours, meet the dean sessions, and discover many resources, clubs, and options available to them. Showcase, which begins at 1 p.m., provides the opportunity for Kelowna businesses, not-for-profit agencies, on-campus clubs and course unions, and campus partners to promote and share their services available to students. Showcase takes place behind the University Centre. The day ends with a fire-safety demonstration at 3 p.m. in the Commons.